Alex S Jones; Annenberg Foundation Trust at Sunnylands. ; Annenberg Public Policy Center. Institutions of American democracy series. xix, 234 pages ; 22 cm. Pulitzer Prize-winning journalist Alex S. Jones explores how the epochal changes sweeping the media have eroded the core news that has been the essential food supply of our democracy. At a time of dazzling technological innovation, Jones says that what stands to be lost is the fact-based reporting that serves as a watchdog over government, holds the powerful accountable, and gives citizens what they need. In a tumultuous new media era, with cutthroat competition and panic over profits, the commitment of the traditional news media to serious news is fading. Should we lose a critical mass of this news, our democracy will weaken--and possibly even begin to fail. This book is also a call to arms. Despite the current crisis, there are many hopeful signs, and Jones closes by looking over the horizon and exploring ways the iron core can be preserved.--From publisher description. 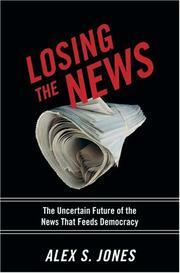 Add tags for "Losing the news : the future of the news that feeds democracy". schema:about <http://experiment.worldcat.org/entity/work/data/795005678#Place/verenigde_staten> ; # Verenigde Staten. schema:about <http://experiment.worldcat.org/entity/work/data/795005678#Place/usa> ; # USA. schema:isPartOf <http://experiment.worldcat.org/entity/work/data/795005678#Series/institutions_of_american_democracy_series> ; # Institutions of American democracy series. <http://experiment.worldcat.org/entity/work/data/795005678#Series/institutions_of_american_democracy_series> # Institutions of American democracy series.